Viral internet sensation STEVE 'N' SEAGULLS are back! 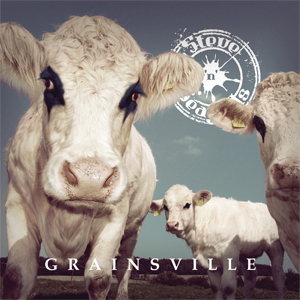 Their third album, Grainsville, will be released on August 31. It is preceded by lead single "Panama"- a "hillbillyfied" version of the VAN HALEN classic. Watch the video on KNAC.COM HERE. For the uninitiated, S'N S shot to fame thanks to their bluegrass versions of metal classics, which proved hugely popular across the w-w-w, garnering fans all over the world. The videos from the two previous albums have racked up over 100 million views on YouTube while the records have sold tens of thousands of physical copies. Streams are now hitting the tens of millions. "We started working on this '80s masterpiece almost a year ago in the Finnish countryside," the band said about the new track. "It was one of the first songs we looked at for our upcoming third album. When Hiltunen and Herman started to bang out those iconic riffs with the accordion and the banjo, it immediately sounded right. Some nice booty shakin' flavours were then added in the studio, and now here it is. This is an ode to the Finnish summer heat and all the old Toyotas still rollin' down the streets..."
The band is also known for their commitment to touring and entertaining live shows - and Grainsville will once again be supported by extensive live activity, kicking off in July. All STEVE 'N' SEAGULLS U.S. tour dates are below.